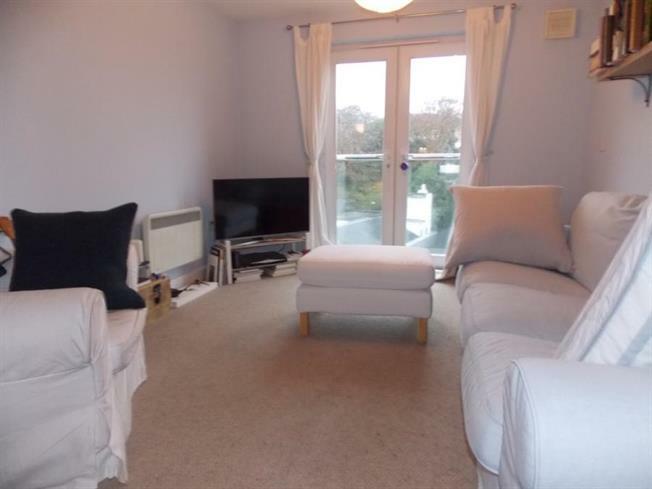 1 Bedroom Upper Floor Flat For Sale in Penryn for £125,000. A LOVELY MODERN ONE DOUBLE BEDROOM APARTMENT located in this TUCKED AWAY LANE just off Penryn town with a car park provided for residents only. An extremely light and spacious apartment located on the top floor therefore enjoying the elevated views over the town and over towards the Penryn River in the distance. The open plan living area is very sociable and incorporates kitchen, living, dining room with door off to a generous sized double bedroom, door to a well equipped quality shower room which leads onto a very useable deep storage/airing cupboard. Located in the communal entrance hall is a good sized storage area and a lift to all floors, outside there is private residents parking. A short walk from the heart of Penryn town; ideally situated for access to all local amenities including bespoke shops, local stores, pharmacy, galleries, bars, delicatessen and much more. The university campus at Tremough is located just a 10-15 minute walk away with an out of town supermarket approximately a mile away. Security door with secure entry system, leads to the communal area where the storage units are situated, stairs and lift to all floors. A generous area with coat hanging space, wall mounted consumer unit, loft hatch, door to shower room and door into living area. Light and spacious open-plan living area with double glazed French doors opening to a Juliette Balcony with stainless steel handrail and safety glazing below taking in the far reaching views. The kitchen area has a good range of wall, base and drawer units with roll top work surface, inset stainless steel sink, integrated cooker with electric hob and extractor above, integrated fridge/freezer, washer/dryer, space for dining table and chairs, door to bedroom. Light and spacious room with double glazed window enjoying elevated views, door to shower room. Access door from both the entrance hall and bedroom, a quality fitted shower room with a generous corner shower cubicle incorporating massage jets, rainfall showerhead and integrated radio, wash hand basin with built in vanity unit below, recess lighting, WC, heated towel rail, extractor fan. Door to a large airing cupboard housing the hot water system with further storage and shelving over. Shared between fifteen apartments and accessed from within the building on the ground floor, ideal dry storage with lighting and bike racks. For the private use of the residents only. Leasehold. Remainder of a 125 year lease which we understand does not restrict the keeping of pets and also long and short term letting is permitted. Service charge for July 2018 to June 2019 is £68.33 per month. Ground rent £114.25 per month.